Yes, Chef! Culinary Events Grand Opening Yes, Chef! Culinary Events Grand Opening - Yes, Chef! Culinary Events - Atlanta Cooking Classes, Team Building and Culinary Private Events: Inspiring people and imaginations through the kitchen. (May, 2011) SANDY SPRINGS, GA – Yes, Chef! Culinary Events, Atlanta’s newest cutting edge cooking school is the brainchild of local cooking and entertaining expert, Cyndi Sterne. After years of leading wildly popular cooking classes for adults and children at the Marcus Jewish Community Center, Sterne had the inspiration to open her own school and name it after her encouraging father, Hal. Opening in Sandy Springs in June, Yes, Chef! Culinary Events will boast two cooking class studios, each having the latest and greatest kitchen appliances from Wolf and Viking ranges and ovens to SubZero refrigerators. “My biggest goal in opening Yes, Chef! Culinary Events is to show people that cooking can be a fun experience and not stressful,” comments Sterne. “We have a huge range of classes planned, covering everything from recreating menus from a Parisian Café, to Farmer’s Market tours which ends with a farm to table dinner in the truest sense, as well as tricks to creating fabulous fondants. The one common thread is teaching a necessary skill in a relaxed, and entertaining atmosphere.” concludes Sterne. Yes, Chef! Culinary Events is dedicated to providing an unprecedented experience to those who seek culinary adventure, would like to enhance their current skills, or are looking for a fun, alternative form of entertainment. Each class participant will leave with culinary knowledge, as well as encouragement for them to explore and expand their cooking skills. This fresh, modern approach to teaching cooking techniques is how Sterne has built her reputation as one of Atlanta’s preeminent cooking and entertaining specialists. The wide array of classes are taught by Sterne, as well as Atlanta’s premiere chefs and culinary artisans from the entire region and vary in price from $35 to $85. In addition to classes focusing on individual students, Sterne will also gear classes and events at Yes, Chef! Culinary Events to Corporate Team Building through Cooking, Hands-On Couples Classes and even Children’s Camps and Birthday Parties. Above all, Yes, Chef! 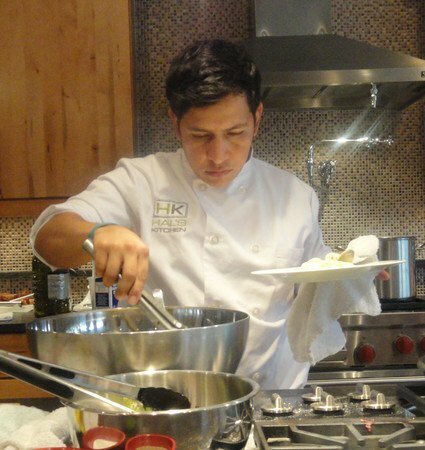 Culinary Events is a cooking school that highlights having fun while cooking. The goal of these classes is for students to feel great about their newfound culinary skills and abilities. Students will all leave with copies of the recipes they’ve mastered so they can make these dishes at home, and experience the elation of their guests savoring the fabulous meal they’ve learned to prepare. “I want people to relax and enjoy the process of cooking,” states Sterne. “What I’ve experienced time and time again is that the more relaxed students are in the kitchen and the more excited they are, the better their dish turns out,” she concludes. Although Yes, Chef! Culinary Events is an adult focused cooking school, there will also be special kid’s camps throughout the summer, including the innovative “My Very Own Cooking Show,” that will not only teach participants how to prepare themed menus, but also demonstrate their new skills in front of the camera. Yes, Chef! Culinary Events will also offer a variety of themed children’s birthday parties, such as Happy Birthday, Cupcake, Sweet as Pie, Pizza Party and Good Morning Sunshine, teaching kids and their friends how to make fantastic scones, muffins or biscuits. Students of all ages who are seeking an exciting new culinary adventure are sure to find it at Yes, Chef! Culinary Events. Yes, Chef! Culinary Events is truly a cooking experience worth craving. This state-of-the-art cooking school will be opening in June at 206-B Johnson Ferry Road, in Sandy Springs, at the corner of Sandy Springs Circle. For more information and a complete calendar of June and July classes, please call 404.847.6991, or visit www.yeschefatlanta.com.